It is late. Like, 10:00pm late. Bedtime has taken 90 minutes, 17 sips of water, 8 kisses, 5 stories, 3 cover readjustments, 2 trips to the bathroom and one final threat to stay in their room or else. I am ready to relax, just for a little bit, before the whole crazy production starts all over again tomorrow. At the beginning of the year I tried to be really creative and health-conscious with the food I sent to school. My goal was to stock my son's BPA-free, eco-friendly bento lunch box with colorful representatives from the entire food pyramid. The vegetables always came back untouched, of course, but I kept sending them anyway because the experts say that if you keep presenting nutritious foods to your child they will eventually try them, but really it was because I wanted the teacher to think I was a good mom. Now it is May and, well, I'm tired. I'm 5 episodes behind on "Grey's Anatomy" and I had to find out that McDreamy died through Facebook. I am feeling seriously uninformed on pop culture and school lunches are to blame. Click here for school lunch envy. While I cut the crusts off ham sandwiches and shake goldfish into baggies, I resentfully think about all the things I could be doing instead. I could be reading a book. I could be shoe shopping online. I could even be organizing the giant pile that has accumulated on the dining room table. Anything but this. And then it hits me. My mom did this every school night. She had 3 kids, so she made lots of lunches every night for lots of years. I pause for a moment to do a few calculations in my head, as well as I can at 10:00pm. My mom made school lunches from 1987 until 2009. TWENTY-TWO YEARS of school lunches. I mean, she got a break on Fridays when they served those killer rectangle pizzas, but for the better part of TWENTY-TWO years she unwaveringly packed white bread sandwiches and Handi-Snacks and Bugles and Fruit Roll-Ups and Capri Suns. You know, the kind of cool stuff that every 90s kid hopes and prays is is in their lunch because she not only packed lunches, she packed lunches that were the envy of the cafeteria table. And she did it for TWENTY-TWO YEARS. My mom even packed our lunches for us through high school. 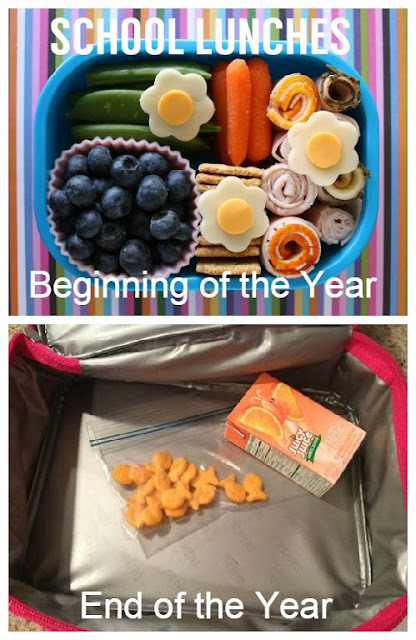 I remember some of my friends were in charge of packing their own lunches by then; their mothers had passed the task on to them either with the hopes of teaching their children some responsibility or because they were just tired of the whole thing, but probably a little of both. Not my mom. She always handed me a lunch on the way out the door. She didn't have to, but she did. I don't even know if I ever said thank you. TWENTY-TWO YEARS. I just can't get that number out of my head. She did this mundane, tedious task for her children every school night for twenty-two years. She also sat in thousands of carpool lines. 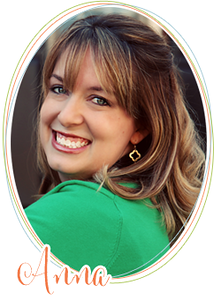 She lost hundreds of hours of sleep soothing fussy babies, caring for sick kids and staying up late to sew Halloween costumes or dance recital outfits. She spent her hard-earned money on things for me, things I probably didn't need, but things she wanted me to have because she loved me that much. My mom and me in 1982. She is oblivious to the fact that she has 22 years of school lunches ahead of her. Sometimes love isn't climbing the highest mountain or swimming the deepest sea. Love doesn't have to reach as far as the moon and back. Sometimes the best kind of love is found in the ordinary faithfulness of packing twenty-two years of school lunches. So thank you, Mom, for all of the daily sacrifices you made for me that I never seemed to notice. At the time it was impossible for me to comprehend the true depth and scope of motherhood, but I knew I felt cared for, I felt safe and I felt special. You gave me an incredible gift. Because of you, I wanted to be a mom too. So I will cut off crusts and I will slice strawberries because my mom did it for me, and I want to take the blessings that she poured into my life and pass them on to my children. "I love you 2,340 school lunches!" I am in tears, like sobbing in the carpool line. I needed to be reminded that those little things matter when I feel like I am usually screwing it all up. You have a beautiful way with words. Love you!